Are 13Essentials plant additives intended for use with soil or hydroponic elements such as rock wool or coco? 13Essentials plant additives can be used for all plants whether grown in soil or hydroponically or in any media such as coco. Is 13Essentials safe for use? Yes. It has been tested for oral and dermal toxicity per OECD guidelines and has been found to be non-toxic. It can be sprayed on leaves, flowers, and fruit. It can also be used as a seed treatment by soaking and drying seeds prior to planting. Personal protective equipment such as gloves and eyeglasses are recommended when spraying 13Essentials. 13Essentials is a balanced nano-scale foliar feeding system containing Silica plus 12 other nutrients – Fe, Mg, Mn, Zn, Cu, P, Ca, S, K, Mo, B, and Co.
What is the recommended application and dosage of 13Essentials? I teaspoon (5 ml) of 13Essentials should be diluted in 1 gallon of water and sprayed on both sides of the leaves once a week in the morning for outdoor plants and at the start of lighting cycle for indoor plants. Shake the bottle well before drawing the dose. Do not premix 13Essentials with water for later use. Diluted material must be sprayed within 2 hours of mixing. Why is the dosage of 13Essentials so much less than other foliar feed systems? How does 13Essentials benefit my plants? Due to its particle size, 13Essentials penetrates the leaf through the stomata, making all essential nutrients and micronutrients available for a more efficient photosynthesis. Greater photosynthesis efficiency increases plant health and improves resistance to disease. Bioavailable silica in 13Essentials makes plants rigid and more erect leading to further increase in photosynthesis. Increased photosynthesis captures more carbon from the atmosphere and liquid carbon goes down to the root zone from where it oozes out to feed the microbial life. Microbes and fungi, fed on carbon break down the bonds of chemicals which then become bioavailable to the plants and fix atmospheric nitrogen. What role do the micronutrients in 13Essentials play in improving plant health? Micronutrients are essential for plant growth and play an important role in balanced crop nutrition. They are as important to plant nutrition as primary and secondary macronutrients, though plants don’t require as much of them. A lack of any one of the micronutrients can limit growth, even when all other nutrients are present in adequate amounts. Sulfur in plants helps form important enzymes and assists in the formation of plant proteins. Boron is required for membrane stability and plays a crucial role in fertilization of flower blooms. Copper activates enzymes and catalyzes reactions in several plant-growth processes. The presence of copper is closely linked to Vitamin A production, and it helps ensure successful protein synthesis. Iron is essential for crop growth and food production. Iron is a component of many enzymes associated with energy transfer, nitrogen reduction and fixation, and lignin formation. Manganese functions primarily as part of enzyme systems in plants. 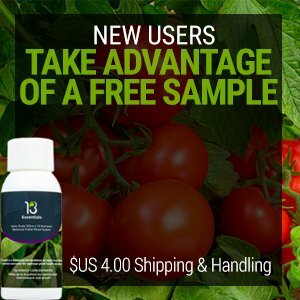 It activates several important metabolic reactions and plays a direct role in photosynthesis. Manganese accelerates germination and maturity while increasing the availability of phosphorus and calcium. Molybdenum is a trace element found in the soil and is required for the synthesis and activity of the enzyme nitrate reductase. Molybdenum is vital for the process of symbiotic nitrogen fixation by Rhizobia bacteria in legume root modules. Zinc is taken up by plants as the divalent Zn+2 cation. It was one of the first micronutrients recognized as essential for plants and the one most commonly limiting yields. Although Zn is required only in small amounts, high yields are impossible without it. Cobalt is a primary constituent of Vitamin B12 as well as Propionate. Propionate serves as one of the main sources of energy which a plant uses to continue to grow. Vitamin B12 is needed for cell division. Calcium is responsible for holding together the cell walls of plants. When calcium is deficient, new tissue such as root tips, young leaves, and shoot tips often exhibit distorted growth from improper cell wall formation. Calcium is also used in activating certain enzymes and to send signals that coordinate certain cellular activities. Can 13Essentials be used on plants that are already healthy, or should I wait to use it until I see a deficiency? 13Essentials should be sprayed each week per label during the vegetative and flowering stage of the plant. Should residual nutrients from the soil be flushed out before harvest, and do you feed up until that time? It is recommended to flush the media prior to harvest when growing consumable fruits/flowers where plant ready nutrients have been fed to containerized plants. nutrient build up in the media may alter the taste of finished goods. Flushing allows the plant time to use up any residual compounds resulting in a cleaner finished products. However, this is not necessary with non-consumable plants or those grown outdoors directly in the ground. Can 13Essentials plant additives be used in conjunction with my indoor lights? Yes, 13E can be used with indoor lights as long as the R.T.U is sprayed as soon as the lights come on and there is proper airflow (fan). 13E doesn’t contain Nitrogen so there is no burning, the product is very gentle. How is 13Essentials sold, and how much can I buy in a single pack? 13Essentials plant additives are sold in 5 pack sizes – 1oz, 2oz, 4oz, 8oz, and 16oz. No, shipping is included. We ship via USPS first class mail. 16 oz bottles are shipped via USPS priority mail. Can 13Essentials be purchased in stores? Here is the list of stores carrying 13Essentials plant additives. How exactly do you treat seeds with 13Essentials? Shake the bottle well. Add 1 teaspoon of 13Essentials to a cup of water and soak the seeds for 30 minutes. Dry the seeds and plant them right away. We do not recommend storing treated seeds for more than a couple of days after drying. 13Essentials is a natural product, derived from naturally mined minerals such as iron, zinc etc. These nutrients are already available in soil but not always bio-available to the plant. 13Essentials is also a nanoscale formulation whereby you dose a very small fraction (1 teaspoon over 25 plants once a week) of conventional products. Under current definitions, it is not certified as organic. We consider it to be a “post-organic” 4th generation nanoscale product with a very small carbon footprint. Does 13Essentials replace nutrients, or should I continue to use my normal mix with it? It replaces your micronutrients, but not your macronutrients such as Nitrogen, Phosphorus, and Potassium. Will 13Essentials work in water-only systems? It will. We recommend adding our other product, Nualgi Ponds for dosing in the water to keep the water aerated and free of nuisance algae. Can I pre-mix 13Essentials and store for future use? No, it should be mixed and used up as soon as possible. Diluted product should not be kept for more than a few hours. I like to keep the pH I water with at 7.0. Is a neutral pH okay for your fertilizer? I have seen other liquid fertilizers state that pH should be kept between 5.3 and 6.8 to prevent nutrient lock. What do you think? Using water at a pH of 7.0 will work just fine for 13essentials. The reason your fertilizer recommends a pH of 5.3-6.8 is for Phosphorus solubility in a soil/media and the chemistry of the micronutrients. 13Essentials is a foliar spray and because the nanoparticles nutrients are adsorbed to a silicon matrix, they are protected from being bound up by the pH of the mixing solution.